TIRUPATI: The annual budget of the temple administration of Tirumala Tirupati Devasthanams (TTD) has almost touched the Rs 1,000-crore mark. But, interestingly, the country's richest religious body also happens to be the biggest tax-evader in Andhra Pradesh. The temple management owes Rs 5 crore each to the Tirupati Urban Development Authority (TUDA) and the Tirupati Municipal Corporation (TMC), besides Rs 19-crore tax to the state government for human hair sale. Sources said this would not only impact the developmental activities in the temple towns of Tirupati and Tirumala but would also lead to greater chasm between the TUDA and the TTD. However, the temple administration is 'casual' about tax evasion and argues that as it is a renowned dharmic institute, it should be granted an exemption. According to a highly-placed official from the TTD properties wing, "The TTD has been earning income only through the offerings made by millions of devotees across the world. The construction of guest houses and mutts in Tirumala was possible only because of donations," he said. "Why should we pay tax to the TUDA? In fact, none of the government bodies has taken up development activities in the past two decades in Tirupati." This, even as the state government is sketching bigger plans for Greater Tirupati. Tuda chairman C Bhasker Reddy, who is also an ex-officio member of the TTD trust board, launched a broadside against the TTD for its tax evasion. "All these years, we kept mum as it is a sensitive issue related to the sentiments of the people. But it is affecting our revenues. All the dharmic institutes in Huda and Vuda regions pay tax. Even the state government has asked the TTD to pay it when the latter approached for an exemption", he noted. A TMC official said on condition of anonymity they had constructed a 500-room massive complex in Tirupati for pilgrims on nominal rents. "But they have allotted a good number of rooms to the tourism department. The APTDC in turn let out the rooms charging double the rates from the pilgrims. On what basis should the TTD evade property tax to the TMC?" he asked. "Minus TTD there is no Tirupati. 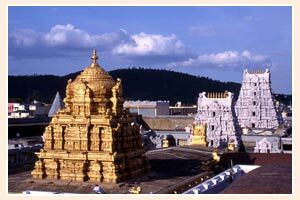 Any government body or any sort of business in the temple town of Tirupati is earning income in various forms only because of the presence of temple of Lord Venkateswara. So there should be some exemption for TTD," P Padmavathi Rao, a retired teacher, opined.